At home I live in slippers or slipper socks throughout the year. 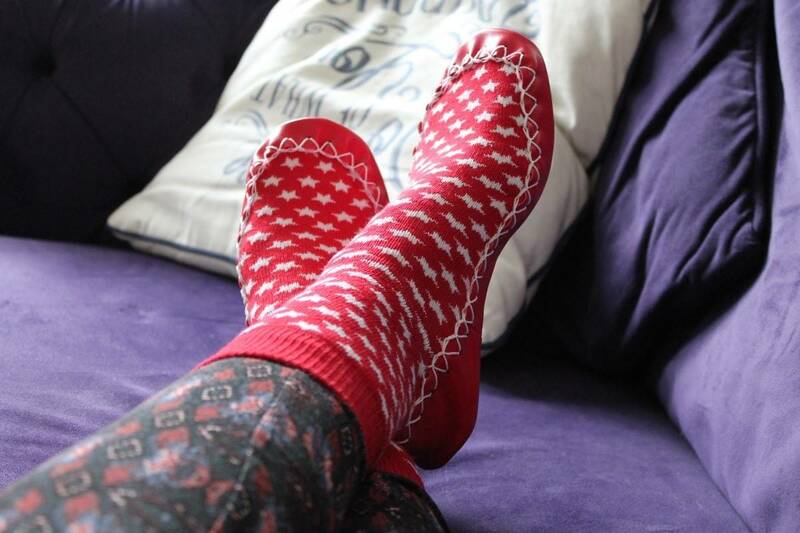 There really is nothing like warm, toasty feet. So when Moccis got in contact to introduce me to their hand sewn Swedish moccasins I just had to try them for myself. Moccis create moccasins for the whole family – both adult and child sizes and styles to suit everyone. Their moccasins pamper and protect your feet – this is why they are recommended by podiatrists above typical socks and slippers. 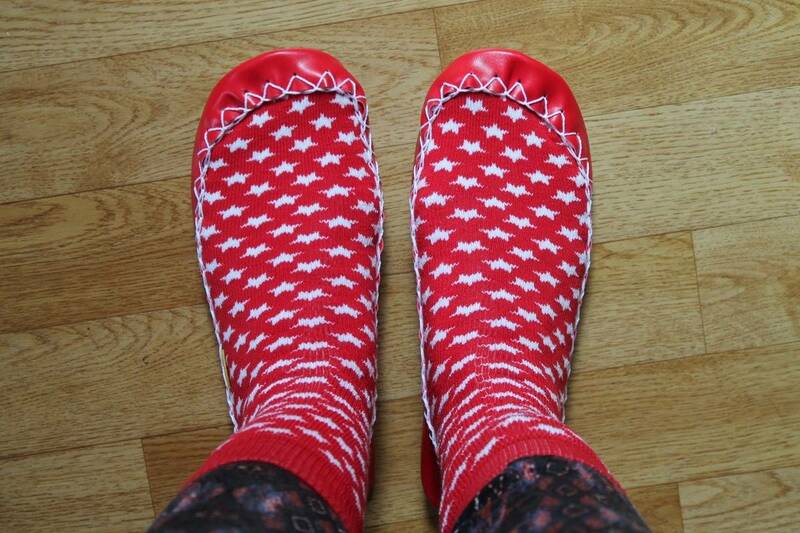 I was sent a pair of Counting Stars Moccis to review – everyone knows how much I love star print. They have a beautiful pattern, with one single yellow star on the back and fitted me well. As I’m in between sizes the sizing was roomy but comfortable. 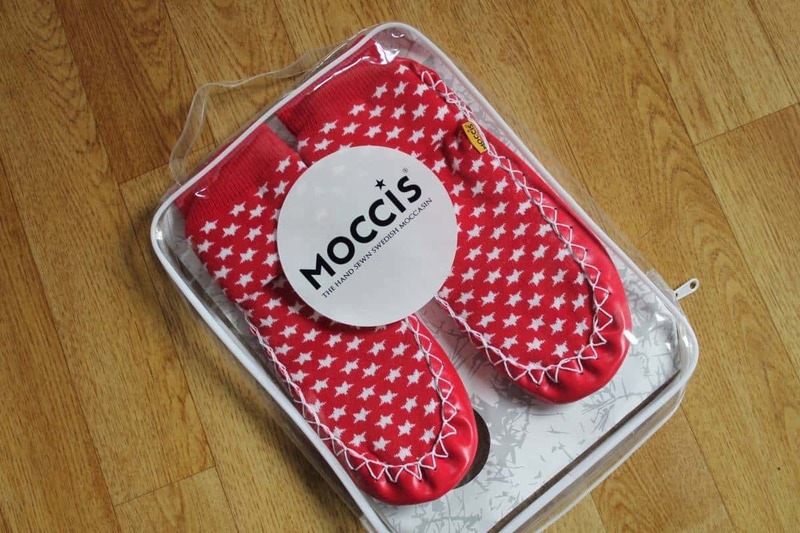 The Moccis are made from machine washable leather and have non-slip soles which I love – with wooden and tiles floors throughout our house I have to be careful with footwear as can slip easily but I had no worries when wearing the Moccis. The stitching on the Moccis is hand sewn which maintains the level of craftsmanship that makes Moccis such a beautiful, traditional product. They are also ethically produced in Sweden to ensure the highest possible quality and keep Moccis carbon footprint as small as possible. I’ve loved wearing my Moccis since they arrived and love that they are so traditional, well made and comfortable to wear. It’s also good to know that Moccis are a brand with such good ethics too – always something I look for when shopping with someone new. Ooh these look fab, you are totally the right person to review them too, you spend more time in pajamas than anybody else I know! I got some for my mother-in-law for xmas. So cute. I love the turquoise one. these look great, and especially in green!! I like the children’s penguin brr. The counting stars look lovely! The Croc Me Up adult moccasins. Warm heart are so cute! I like the Viking Wool moccis from the adult range. I love the penguin ones for my little penguin fan. I stole my partner’s turqouise and grey ones – hehehe! and I used to have yellow ones with licorice allsorts on them – they were worn to death. Finding it hard to track them down now I’m in Australia. Would love to try a pair of these,and love the stars! ???? Warm Heart in size 2 for my granddaughter.She’d adore them !!!! I like the moccasins shown above.